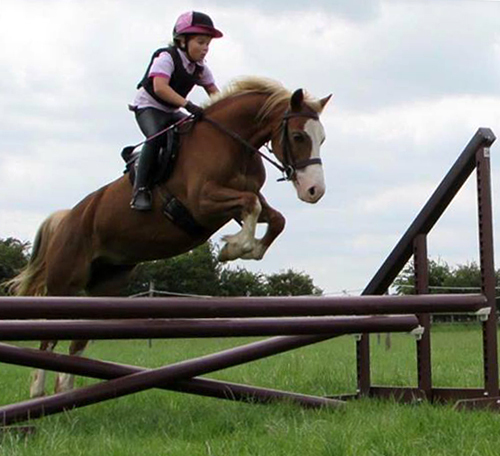 Solution Saddles Customer Stories: Amanda Beevers is over the moon with the SMART™ Native Pony saddle for her daughter and their round pony. Amanda Beevers is over the moon with the SMART™ Native Pony saddle for her daughter and their round pony. My daughter’s very round pony was very hard to fit a saddle to - after various saddle fittings resulting in no saddle due to her shape, I was getting out of my depth and losing the will to live. We moved to a new yard, where I met a girl who had a SMART™ saddle and she couldn't have expressed more just how fantastic they were, so I promptly called Solution Saddles – and it was the best phone call that I have made! The Solution Saddles Approved Advisor came out and fitted a SMART™ Native Pony saddle for my daughter and her pony – it was so exciting to be able to ride again, knowing that the saddle wasn't going to hurt our pony or put pressure on her back like her old saddle did. We are over the moon with it - it looks and feels great and has helped my daughter with her jumping position. ‘’The SMART saddle is amazing - It’ never slipped once, it keeps my position right while jumping, feels comfortable and fits my pony great!" We have never looked back since buying the SMART™ Native Pony saddle and would never have another brand. The after care is fantastic and I would 100% recommend Solution Saddles to anyone.